Preheat oven to broil. 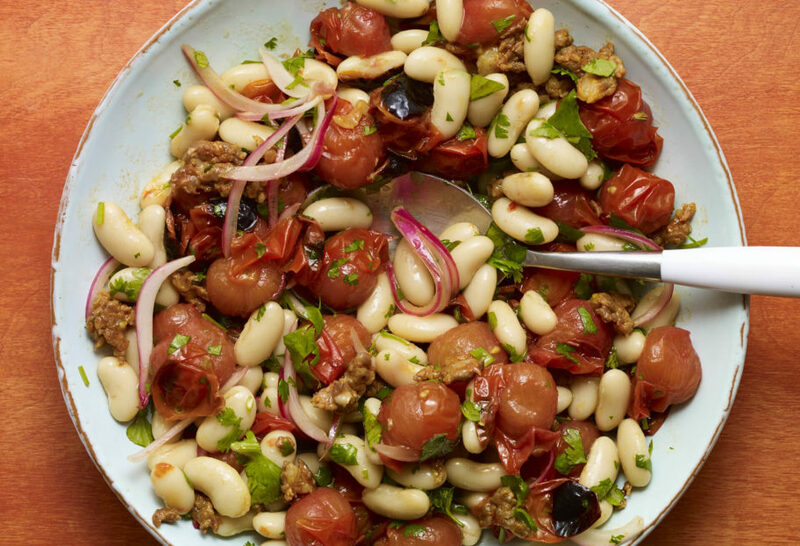 In a small roasting dish, toss to combine tomatoes, 2 tablespoons olive oil and a pinch of salt. Broil until tomatoes are charred and softened but still hold their shape, about 10 minutes. Transfer tomatoes to a large bowl and fold in beans, onions and chiles. Heat the remaining 2 tablespoons olive oil in a small sauté pan over medium heat and cook the chorizo until crisp and browned, about 5 to 6 minutes. Add to bowl with bean mixture and gently fold to combine. Finish with bitter orange juice, cilantro and salt to taste.